The CBM95 Cry Baby Mini Wah is loaded with 3 fantastic wah tones: the low, vintage, and GCB95 settings. You can select this tones from inside the pedal. Plus the CBM95 features true hardwire bypass switching that offers zero latency. There is no tonal coloration with Dunlop's Cry Baby Mini Wah Pedal. The 9V Power Supply ensures the correct amount of power transmitted to your electronic devices. It features an extra-long 10-feet (3m) cable that and met UL 5 safety standards. This power supply powers most effects pedals from Jim Dunlop including the Cry Baby line: GCB95, 105Q, 535Q and more. The Blucoil power supply can also be used with tip negative keyboards or other electronic devices that have similar amp requirements and voltage. Get 4 additional Blucoil Celluloid Guitar Picks when you avail the Jim Dunlop Bundle today! 3 WAH TONES - The Jim Dunlop CBM95 Cry Baby Mini has three fantastic wah tones: the modern GCB95, vintage that's voiced like the Clyde McCoy, and a low setting that is voiced like Jimi Hendrix. ITALIAN-MADE INDUCTORS - Jim Dunlop manufactured this pedal with Italian-made Fasel inductors that were legendary 60s wah sound. These produce great tone, smooth sweeps, and lush harmonics. LESS IS MORE - Don't let CBM95's size fool you, this small unit is packed with great features! It has the exact circuity as GCB95 but has a smaller footprint. 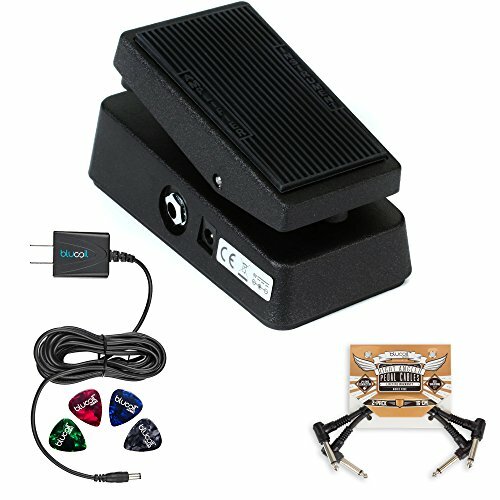 TRUE HARDWIRE - The CBM95 wah pedal has true hardwire bypass that curbs the loss in your tones. INCLUDES - Jim Dunlop CBM95 Cry Baby Mini Wah Pedal. 2-Pack of Blucoil Patch Cables for Effects Pedals. Blucoil Power Supply Slim AC/DC Adapter for 9 Volt DC 670mA with US Plug (Center Negative Polarity). 4-Pack of Blucoil Celluloid Guitar Picks.